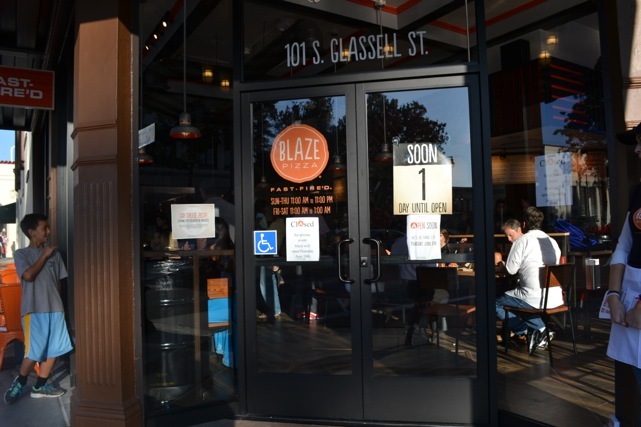 Blaze Pizza just opened at the Orange Circle in Old Towne Orange, and my family got a sneak peek at this hot new pizza restaurant. 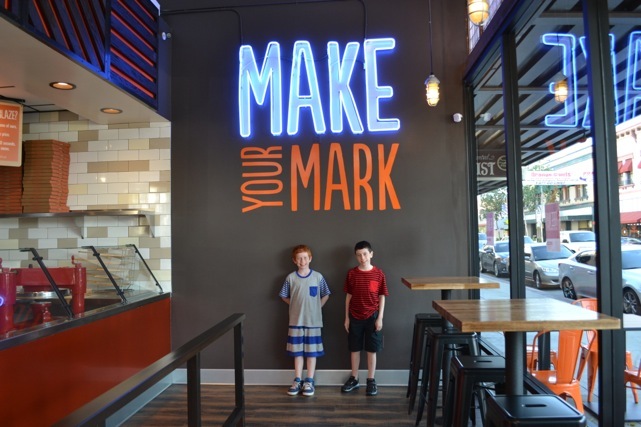 When we stepped inside, we were met with amazing service. They greeted us and asked if we had ever been before? 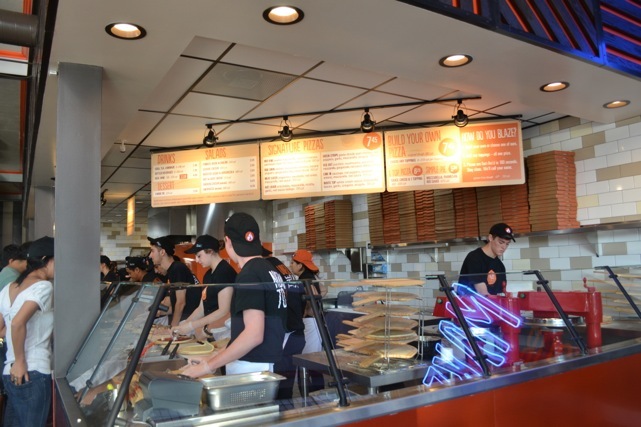 It was our first time, so they talked us through the step by step process, and we were on our way. 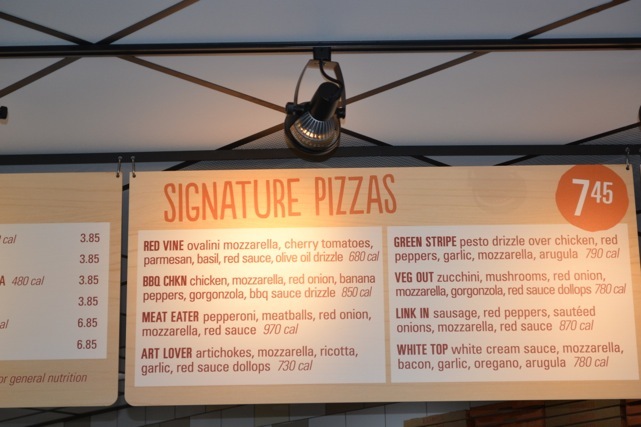 On the menu board, you can choose one of their pizzas, or you can personalize your pizza with any of the available toppings. 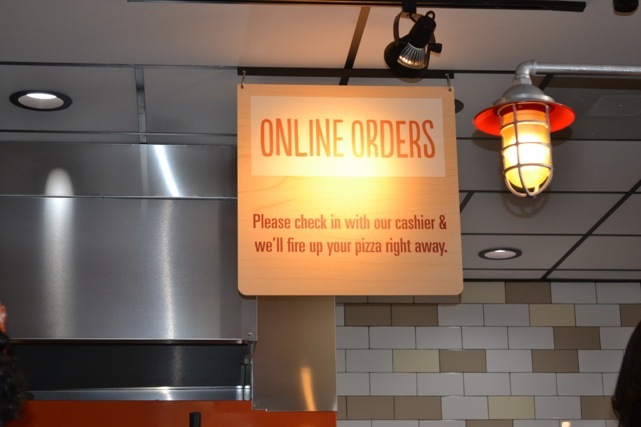 You are also able to choose one of their pizza creations and add or take away items from it. This is all for one amazing price. I decided to go with the “White Top” featuring white cream sauce, mozzarella, bacon, garlic, oregano, arugula, and I added some pepperoni and roasted garlic. It is safe to say no Vampires were lurking around our house that night. 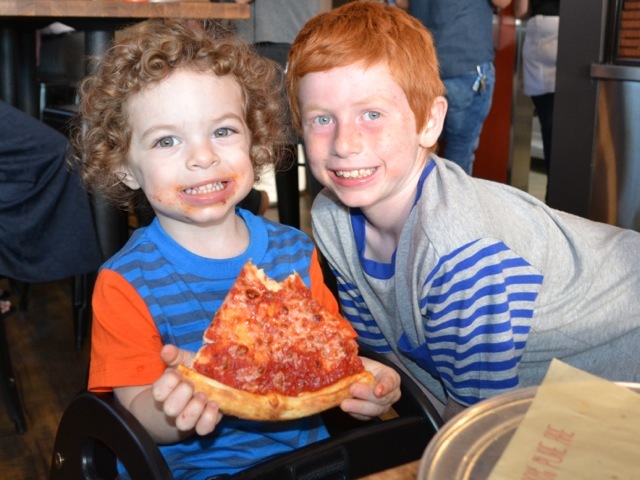 My youngest son got their “Simple Pie” that has mozzarella, parmesan, and red sauce. Just like the name, it is simple, but do not let this fool you, it was very flavorful and we all loved it. 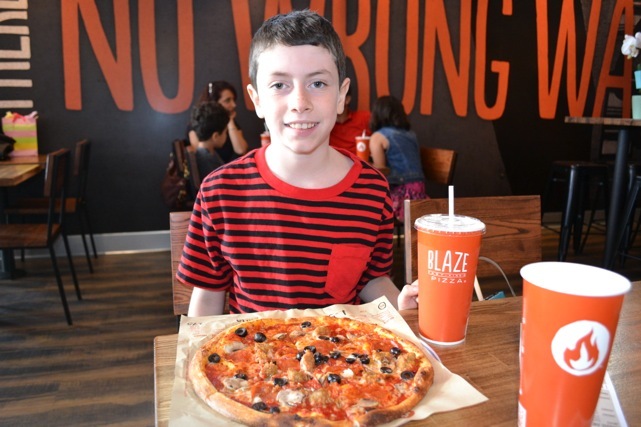 My 8-year-old also ordered the same pizza, but he asked to not have mozzarella added. 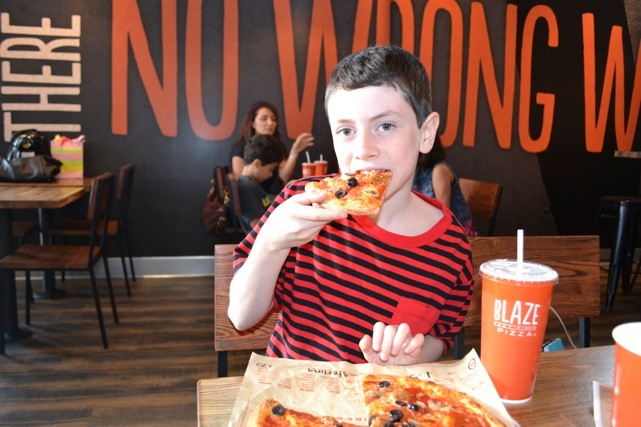 He did not realize what mozzarella was, so if you let your kids go down the line ahead of you be aware and maybe give their pizza a look before they fire it up in the oven. My eldest son went all out and added so many toppings. He was so proud of his masterpiece. 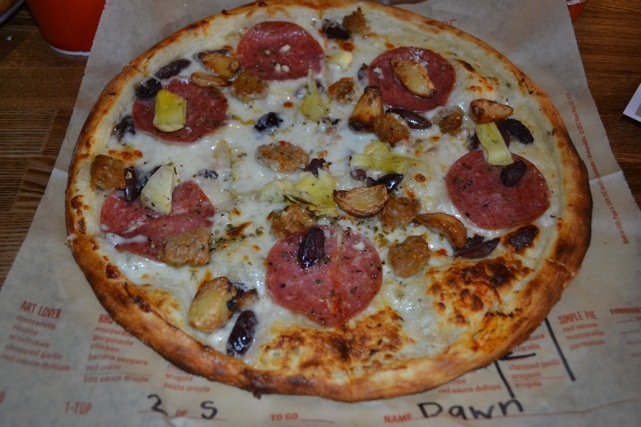 It was very flavorful and I think he did a great job marrying the flavors together. My husband was last to order, and he too went all out with his pizza. 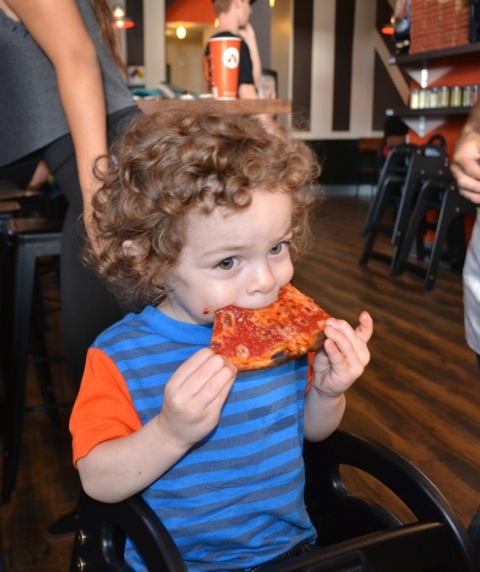 He loved all the choices of toppings but wished they had anchovies. 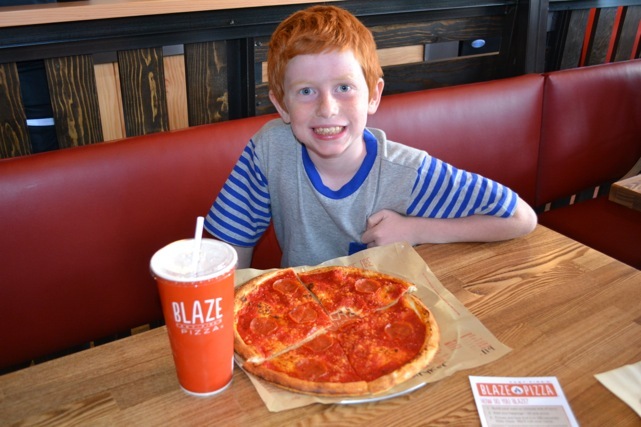 I know it’s not a popular item, but it makes him extra happy when pizza places have them. 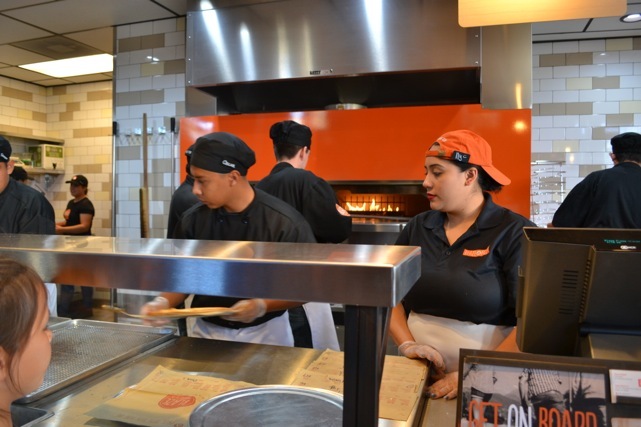 After you go through the ordering line, you pay, and they fast-fire your pizza in 180 seconds! 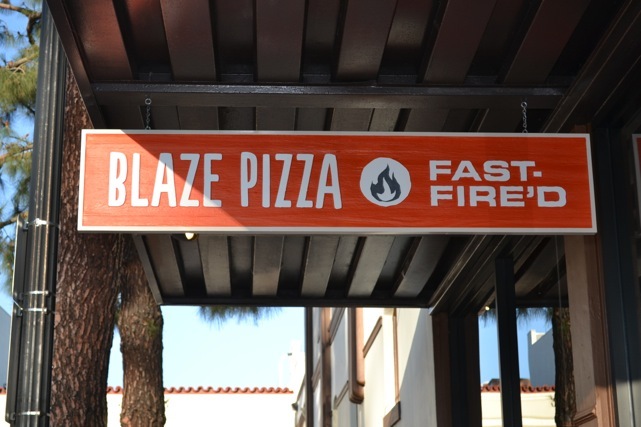 How is that for Blazing fast pizza? 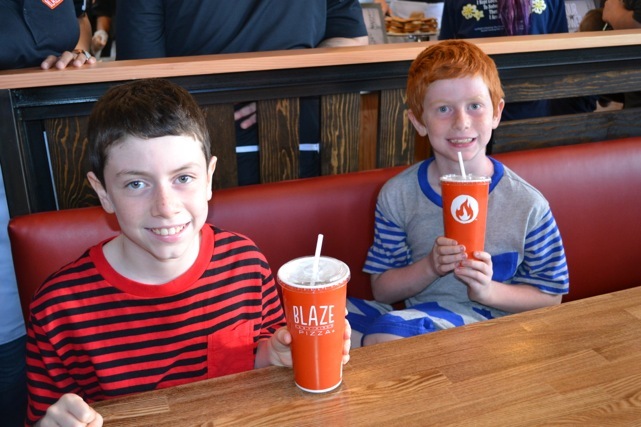 We had just enough time to fill our drinks before they were calling out our names to come pick up our pizza creations. I love the selection of beverages they have. My very favorite was the blood orange lemonade. 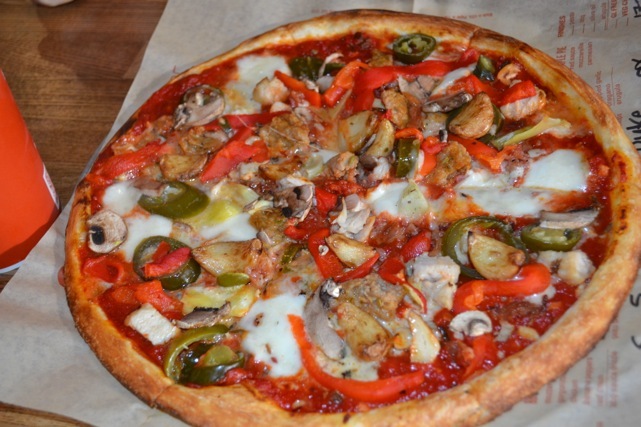 It was slightly sweet and tangy, but very refreshing and went well with my pizza. My family agreed that it was their favorite as well. 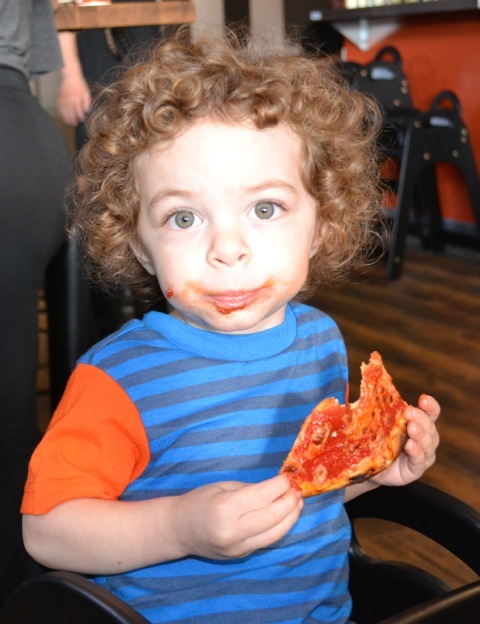 One more thing I must tell you is the crust is a thin crust. 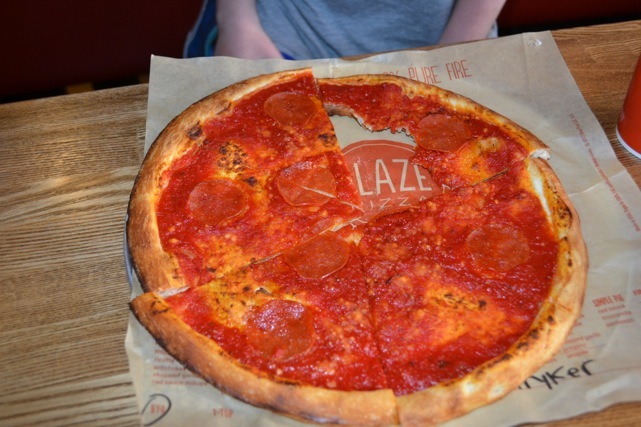 It gives the pizza crust a slightly crunchy texture when they fire it up in the blazing hot oven. We loved it. The flavor was fantastic with the slightly charred edges. 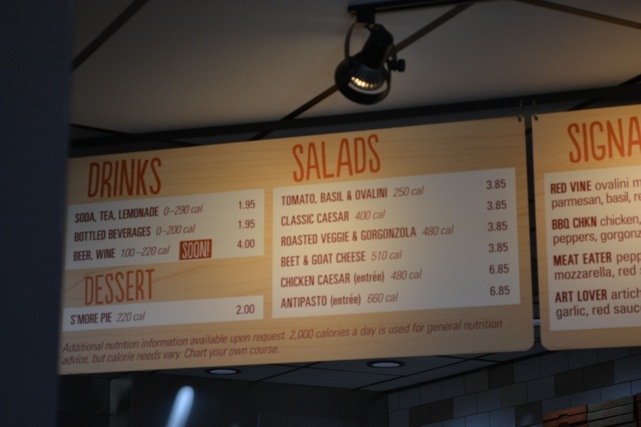 If you have dietary restrictions, they also serve gluten-free crust and vegan cheese. 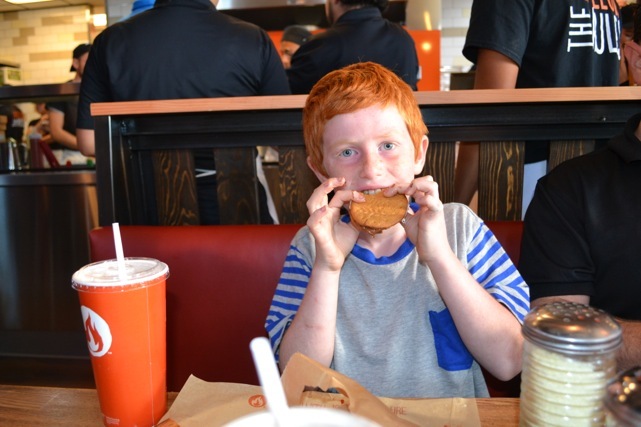 After devouring our pizza, we were able to sample their S’More Pie. It is chocolate and marshmallow sandwiched between 2 graham cracker flavored cookies. They fire it up in the oven then give it to you in a neat little package. If I had to describe this, I would say it is an ooey gooey goodness treat that you must not miss. My oldest son was very happy to learn he could have it because it was nut free. 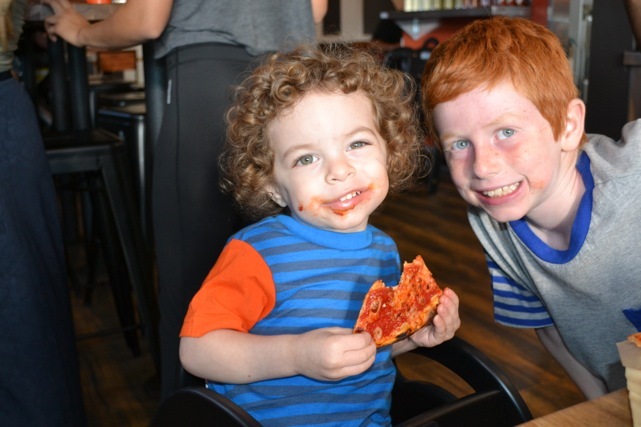 It is big because most places he cannot have dessert, but they assured us it was safe. With our fabulous meal done we were packing up the kids to leave when I was introduced to the owner. He was very nice, and I wished him well. I told him what a great experience we had and how wonderful all the staff was. He was pleased to hear this and thanked us for coming. I know my family, and I will be stopping back here very soon. 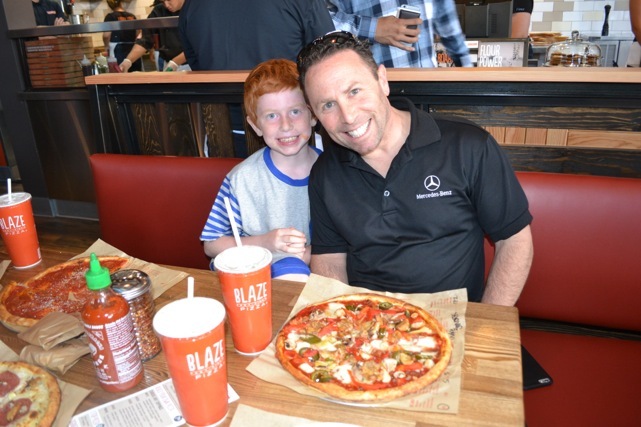 Thank you, Blaze Pizza for making a fantastic quick place to eat tasty pizza. 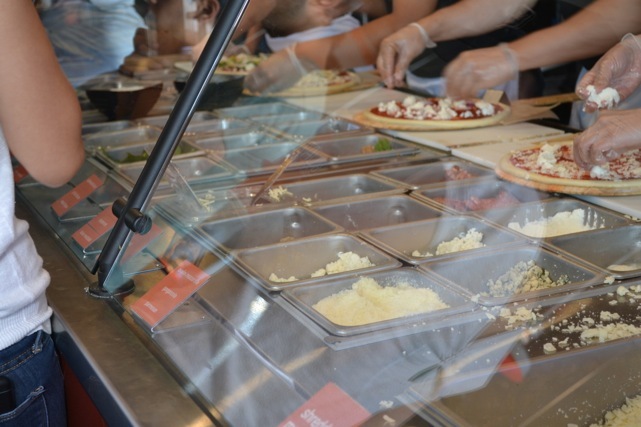 If pizza is not something you are craving, they do have a few wonderful Salads too. You should all give this place a try.